PITTSBURGH (GaeaTimes.com)- For the fans of Oakland Raiders, Sunday’s game against the Pittsburgh Steelers was something that they would hardly like to remember. Not only did the Raiders suffered a disappointing 35-3 defeat against the Steelers on Sunday, it also lost its defensive end Richard Seymour after the player punched Ben Roethlisberger during the second quarter of the game. After the incident, as the Pittsburgh Steelers quarterback collapsed on the ground, the Raiders defensive tackle was ejected from the game. 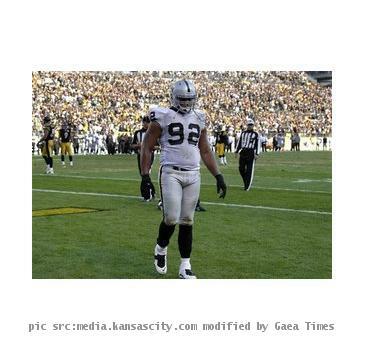 According to sources, owing to his on-field violent action, Richard Seymour might face a league suspension. The incident during Sunday’s game unfolded when Ben Roethlisberger had just completed a 22-yard touchdown which enabled his team to take a lead by 21-3 in the game. As the Steelers player was walking towards the original line he seemed to speak to Richard Seymour for a while which was followed by the Oakland Raiders defensive tackle punching him on his face. While talking about the incident, Ben Roethlisberger stated that he was really taken aback at Richard Seymour’s action as getting hit by him was hardly something that he was expecting. Moreover, the Pittsburgh Steelers quarterback added that Sunday’s game was a pretty physical one where there was a lot of shoving and pushing as well as other extracurricular activities. Big Ben's day short in Steelers' 34-17 loss to Denver; Will his suspension be abridged, too? Andrea McNulty sexualy assaulted ?